Happy Thursday! This last weekend I had some delicious food out, joined a wine club (I’m so snooty), and MISSED OUT on pepper roasting at Portland State Market *sobs*. Hopefully they will be back this Saturday so I can share them with you. Back to business…Do I have a delicious recipe for you. 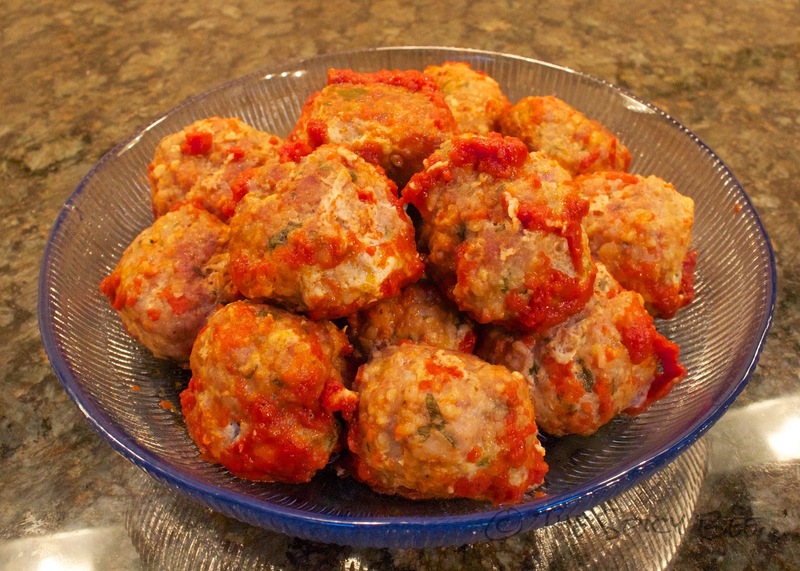 These meatballs make a great meal accompanied with mashed potatoes or even as an hors d’oeuvre (damn the french! Spelling is hard). Recipe after the jump. First thing’s first! Preheat your oven to 450°F. Now combine your bacon and 1 garlic clove into your trusty food processor and process until finely chopped. Add the eggs, bread crumbs and 1 t salt. Pulse to combine, and then add in your mint and pork. Pulse a few more times to thoroughly mix, but do not process into a paste. You are now ready to form your meatballs! Wet your hands and begin forming (this recipe should make about 16 plum-sized balls–our eyes are always bigger than our stomachs so we only got 14 out of this recipe). Space your newly-formed balls into a 9 x 13 inch baking pan (leave a little space between them) and bake for 15 minutes or until browned lightly (likely will look darker on bottom rather than on top). While the meatballs are cooking you can start your sauce. As I mentioned in a previous post, this sauce recipe is very similar to Rick’s Zucchini-Mushroom Tacos (this makes them great recipes to plan back to back!). In your food processor, combine the other 2 cloves of garlic, tomatoes (and juices), chipotle chilis with canning sauce, and oregano; process until smooth. When the meatballs are ready, spoon off any extra fat from the baking pan, then pour in the sauce, covering the meatballs evenly. Bake until some of the liquid in the sauce evaporates making it look more like a paste, about 15-20 minutes. Heat up your broth in a small saucepan. Remove your meatballs from the pan, leaving most of the sauce behind. Stir the broth into the sauce and mix until it’s got a spoonable consistency. Season the sauce to taste. Spoon the sauce over the meatballs and serve.